THE SKINNY: I like the concept and idea behind serums more than the reality. They take too long to see a noticable effect. 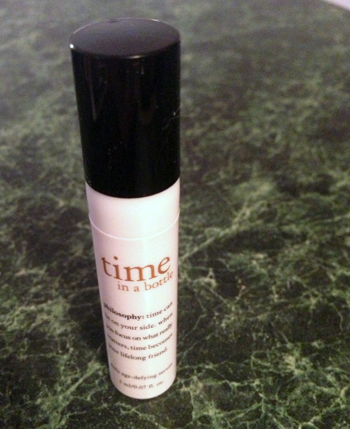 With Philosophy's Time in a Bottle ... I needed to see something, anything, pretty quick to invest a whopping $74 in the full size. And I can;t say that I really did. I like the serum. It goes on well. It felt nice. Yes, I know this product only claims to show result after FOUR weeks. The sample only lasted two weeks; maybe if I had more test product. KEEP OR TOSS: Keep. I'm all for anti-aging ... just not the hefty price tag. CHECK IT OUT: This product is in- and out-of-stock on the Philosophy website, but Sephora seems to have it regularly.